A bottle of this will surely get you drunk! It's like Willy Wonka's factory in here. ELECTRIC GREEN! I love this color! I didn't step on the machine so I don't know mine but I'm secretly hoping that I'm a red. And here's the blue corner. M&M's mugs in their trademark shades. I love how colorful this place is. My eyeballs just won't stop popping out of their sockets! They're quite big on football as well. That's quite a cheerful team, isn't it? How many goals were made? Oh no, Mr. Orange! The orange corner really caught my eye. Look how bright and lovely they are. And I got a nice big hug from this red mascot. I'm not kidding. He literally walked towards me with arms wide open! I like how the staff here let us take photos and even offered to take photos for us and WITH us! How fun is that? 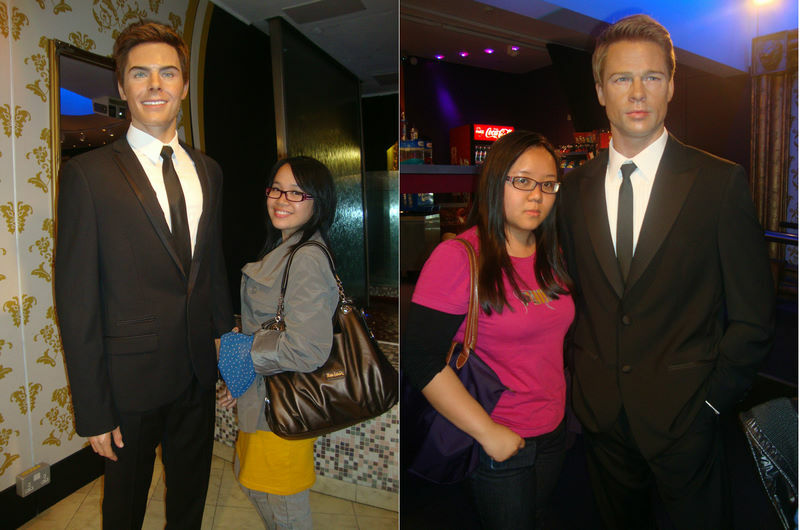 If you're still wondering, this was in London the same day we visited the wax figures. It's a new store at Leicester Square that just opened for business in June so if you happened to be in London, do visit this colorful place because its characters and colors will almost certainly bring a smile to your face! On the day of the "reporting", we took the opportunity to explore London a little bit more. 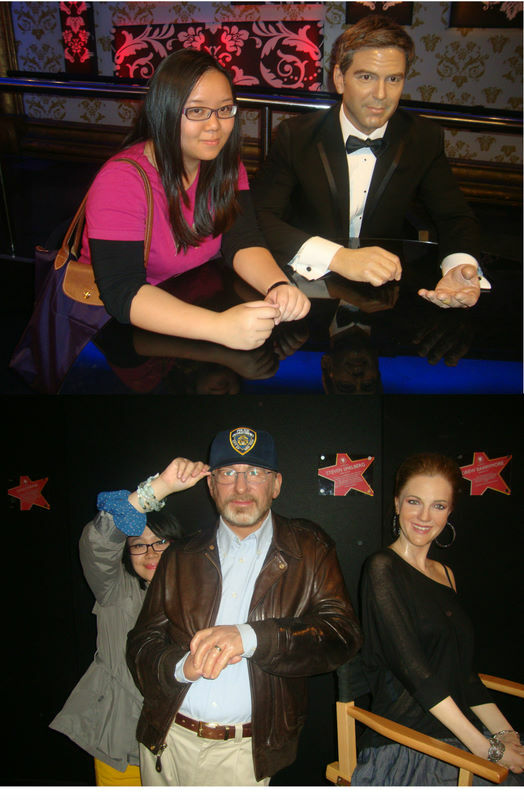 What better way to do so than to visit Madame Tussauds? I'll be a little silly with my post so let me begin my story. We started off by arriving fashionably late with our dates. It wasn't us who were late. It was the guys. They just had to get their hair done to perfection. Once we arrived, I was seated next to Clooney. We had a great chat about Ellen stalking him and of course, the weather. Mimi was nowhere to be found so I went looking for her. 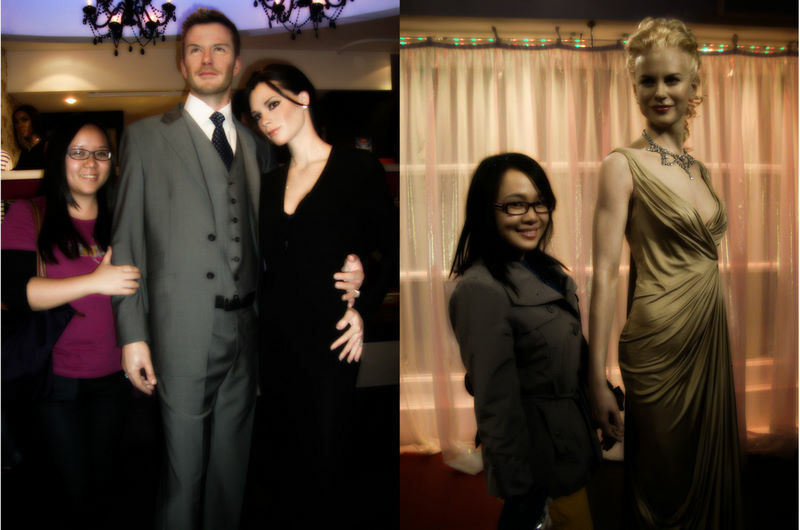 After a while, I found her chilling at the backstage with Spielberg and Barrymore. (left) Me looking extremely odd and awkward next to the Beckhams. (right) Mimi and Nicole on the red carpet. Errr, emm. Lost for words. Basically, Mimi was the decent one. What? You didn't know I was the torch bearer at last season's Olympics? Watch the tape again. 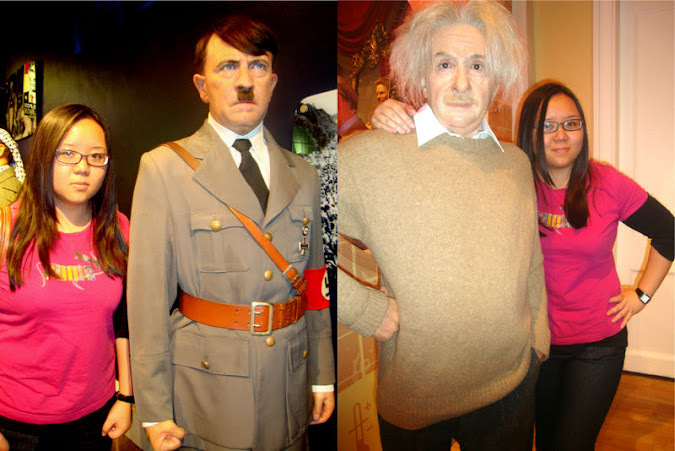 Me with that evil guy and that genius. 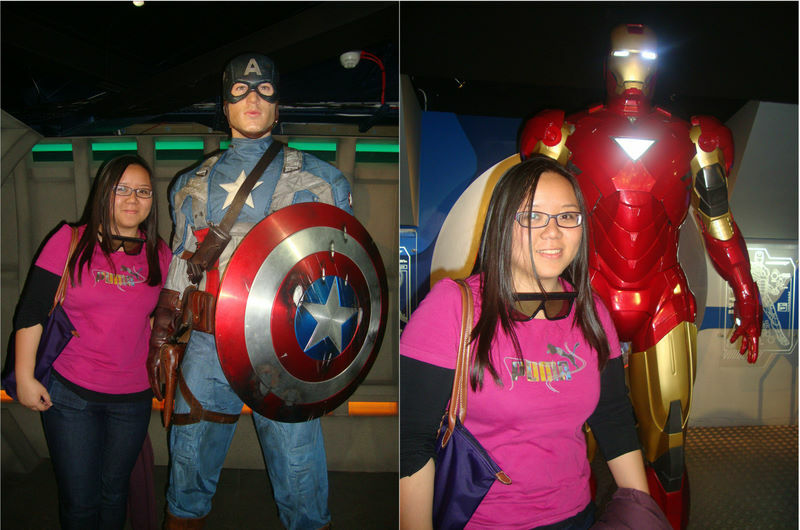 Yay to Marvel comics! I really enjoyed the Marvel 4D show at the theater there. It was ironically my first 3D experience ever so not surprisingly I was jumping off my seat like a freaking noob. So that's about it. I hope you like the pictures as much as I enjoy taking them. This may be my last "adventurous" post. Anything after this will just have pictures of me staring at my laptop because I will be back home by then. But hopefully I can squeeze in one last post before my flight. We'll see. Until then, chao! I'm quite distracted by my sister calling me on Facetime right now so I'll just let the pictures do the talking. Alright, after two hours on the phone with my sister, I've finally hung up and have a good look at this post. I realise that this post deserves more than a line. So here goes. A couple of days ago, Mimi brought me to her school for a visit. The first thing that sprang to mind when I saw the compound was that this campus is so much bigger than the one in Leeds. They even have a separate building for computer science, whereas ours is a shared building. Going from one corner to another takes a pretty long time and the routes are quite confusing for a first-time visitor like me. I love how the uni is very student-centred. Walking around, I feel like a new student all over again. Unfortunately though, I'm not. This uni even has its own rail station. I can't begin to say how much I enjoy my visit here. A very funny looking statue somewhere in the school. Sorry I still can't describe the location in detail but this is right in front of the public health building. Little did I realise I'm now in the computer science field having taken my masters in computing but I'm probably only still vaguely connected to Maths. A very excited me, after sitting on a bench eating an apple and a banana while savouring the serene environment that forms the heart of the campus. The landmark tower at the heart of the campus. You can even see this tower from Mimi's place. Mimi posing with the backdrop of the great hall. Apparently, this is where the graduation ceremonies are held twice a year. Yes, so much bigger than the hall in Leeds. I should probably ease up on the comparisons! Mimi's good old Chemistry department, although she's not studying under this faculty this year. I will be back home in Brunei sooner than you think. There will be tons of things I'll miss about life here, from being a student itself to the environment and the people. The student life, as I know it, is over. Welcome to the cold and cruel world (according to the half-empty hypothesis). This is sort of like a continuation of the last post. If you haven't read the last post, go on and scroll down and have a read before you continue. Anyhoo, I noticed my blog these days are just filled with photos with little or no words. Oh, well. This one is no different. Apparently, the fiddler is a common man on the street of B'ham as he busks almost daily in the same area. Spongebob soft toys machine! Of course, this is one of those machines where you have to hook the item successfully into the chute and chances are pretty slim so I don't even bother to try. This is one of the arcades at Star City that we entered. I like the one at the bowling alley downstairs though. I haven't watch a movie in a cinema for quite sometime now so I hope I can watch one soon. So what was I doing on this wall? Just sesiapun nia. There are quite a few hand prints along the floor leading to the cinema but I have no idea who they belong to. Guess what? I found another Spongebob playing machine. I just love this place filled with Spongebob merchandise! The toilet at Star City also deserves a picture for its nice blend of colour so here's Mimi and the mighty hand dryer. Along the corridor, I found a row of those vending machines with toy bubbles and I can't resist buying some toy bubbles for myself. Yes, I'm a full grown adult. Naturally, I picked the Spongebob vending machine! Whew, that was a long post. Oh, it wasn't? It took me forever to finish this post because I got distracted midway through because I heard that Instagram has new update with new features so Mimi and I were racing to see who update their Instagram first (for the record, I won) Alright, now my post is just getting senseless so until next time! There will be more updates from Birmingham so watch out for more adventures here! I'm in Birmingham! I've left Leeds a couple of days ago so I'll be in this bull city for the rest of the month, thanks to Mimi for having me! You are not in this city if you've not taken a picture with the bull so the first picture is a standard compulsory photo of me and Mr. Bull. For most of the afternoon, Mimi and I walked around the city which is quite big! And here's a random guy shooting bubbles at Mimi. Welcome to B'ham! Here's us in a Blue Dragon mobile. I don't know how we ended up there but we brought back home free sweet chilli sauce! Mimi and I decided to hop in a water bus for a half-hour tour around the canal in B'ham with a bunch of Japanese tourists. One of them even spoke Japanese to us, if only I knew how to reply them...wakarimasen! I don't know what is this weird thing in the middle of nowhere, with hands and legs stretched out and smiling stupidly at the camera. Since we have bus passes, we decided to go on random bus rides that late afternoon. We hopped on the first bus that stopped at one of the stands in the city centre and found ourselves arriving at a small town area. Turns out this town is quite close to the university so we decided to navigate our way back home on foot. But after a while, we came to realise it is actually quite far but thanks to a certain someone who likes to walk, we walked anyway. Somewhere along the road, we passed by this hospital that I just need to show you. Sushi dinner at YO! Sushi: a collection of sushi photos.